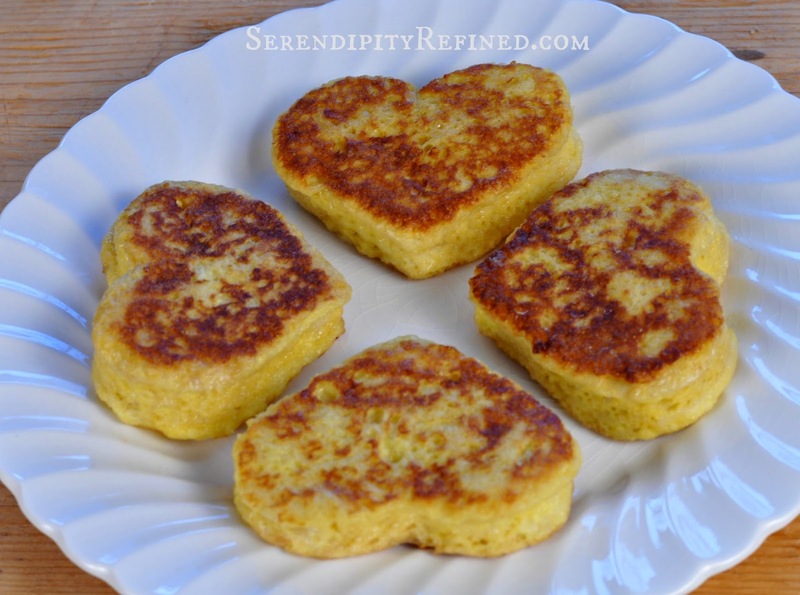 It has been a long time since I've shared a favorite recipe and I thought that with Valentine's day coming up, this is the perfect time to share a super easy way to make simple French toast special without spending a lot of time doing it. 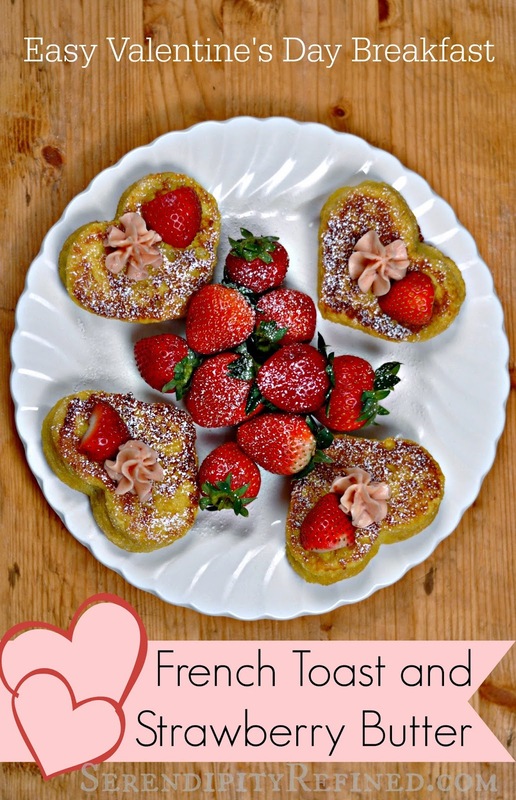 Heart shaped cookie cutters and whipped strawberry butter turn ordinary French toast into a Valentine's day breakfast that your sweetheart is sure to love. fine strainer for dusting with powdered sugar. Slice bread into eight to ten 1 inch slices. 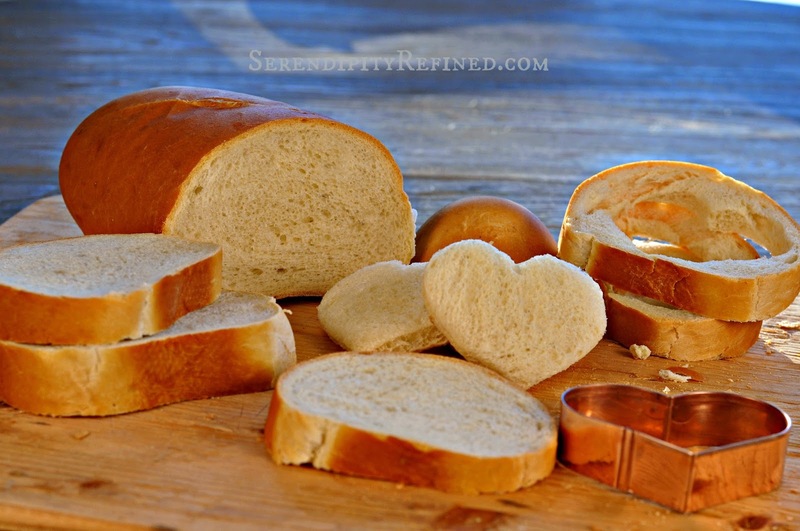 Using a 2 1/2 to 3 inch cookie cutter, cut bread slices into hearts. 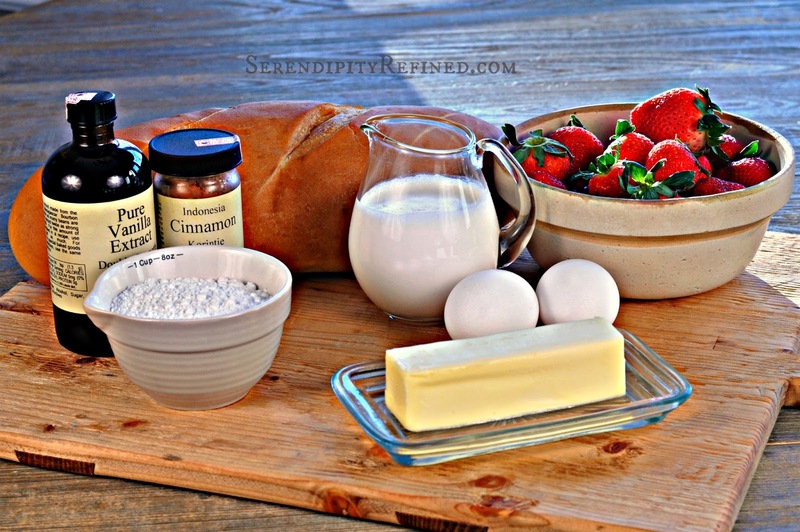 Combine eggs, half and half, cinnamon (optional) and vanilla in a pie plate and mix well. Dip four bread shapes into the mixture, turning to coat both sides. Let stand 1-2 minutes. This will help the bread absorb the egg mixture and to fluff back up after being squashed by the cookie cutter. 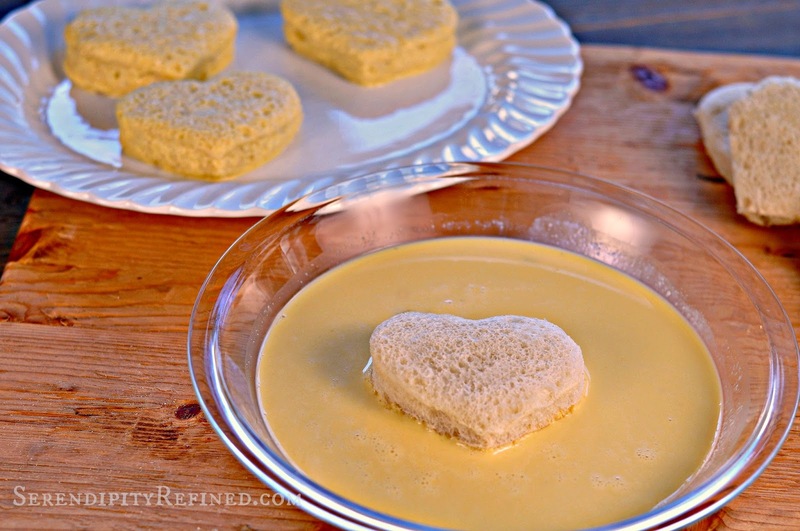 Melt two tablespoons of butter in a 10 inch skillet or griddle. Heat until sizzling. Add four slices of coated bread. Reduce heat to medium and cook bread for 3-4 minutes or until golden brown, turning once. Remove from skillet and keep warm. Clean skillet and repeat the process with the remaining butter and 4 heart bread pieces. Combine all ingredients in a bowl. Beat at medium speed until creamy, scraping the bowl often. Place the mixture into a pastry bag fitted with a star tip and refrigerate until ready to serve. Don't allow it to chill completely or allow it to come back to room temperature prior to serving. 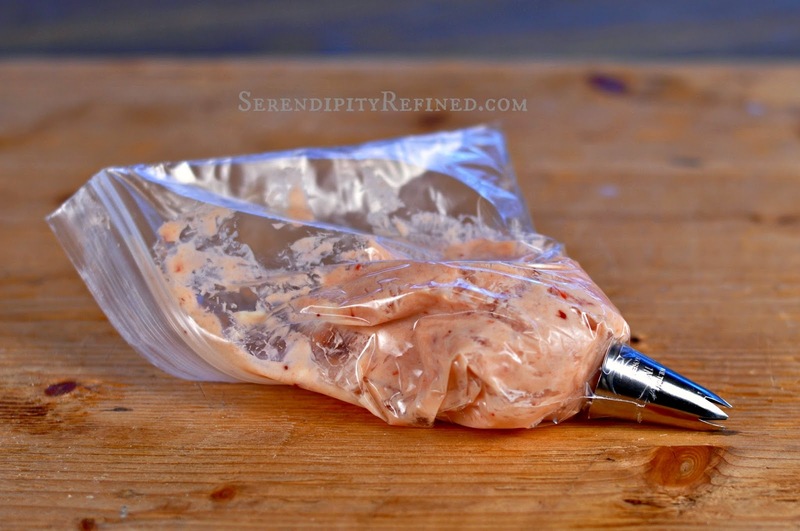 Hint: if you don't have a pastry bag, a sandwich bag with the corner clipped off will also work. 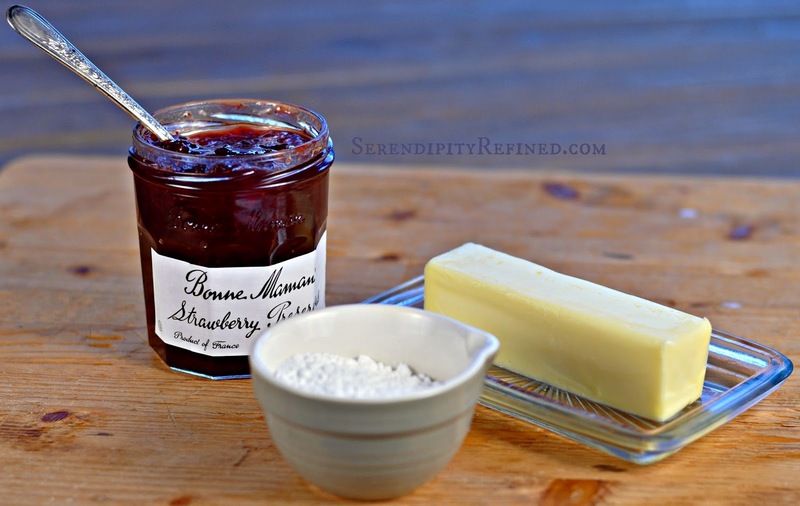 Dust slices with powdered sugar, pipe on strawberry butter and garnish with fresh berries. Serve with warm maple syrup if desired. See?! I told you that it was easy. 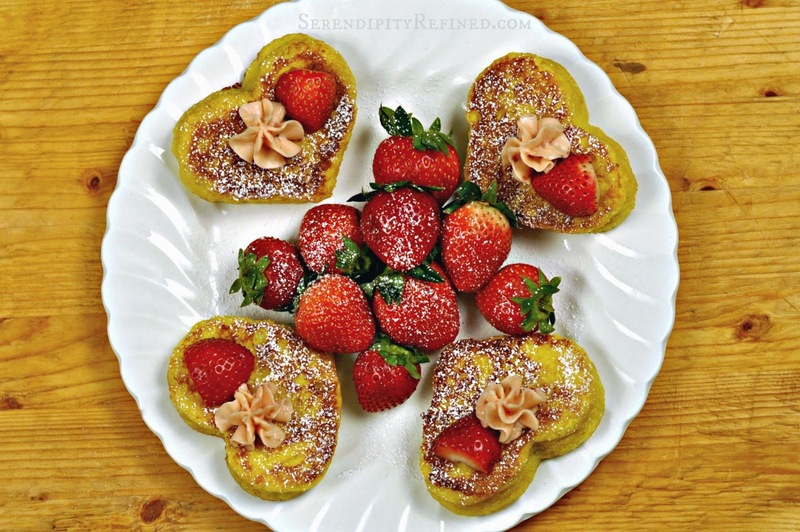 Heart shaped French toast with whipped strawberry butter and fresh strawberries. Perfect for Valentine's day breakfast, a bridal shower brunch, or any time that you want to make someone feel loved without spending hours in the kitchen to do it! Hi! I'm Kimberly. 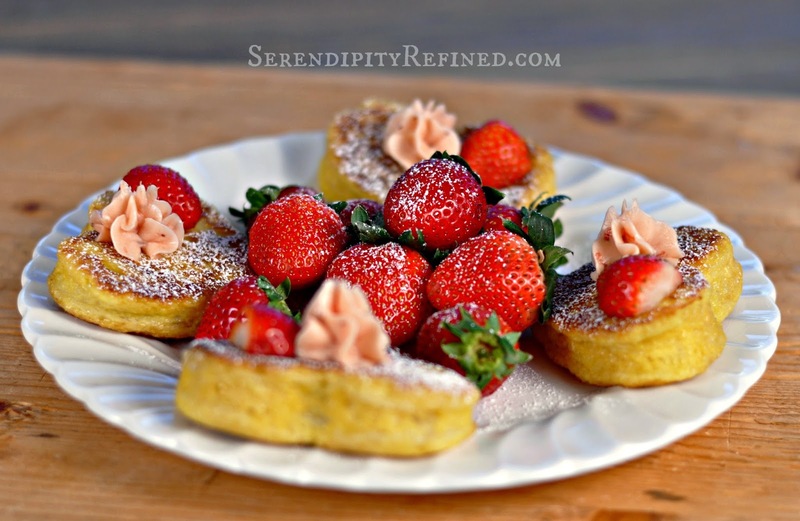 Welcome to Serendipity Refined! This blog is about finding beauty in the ordinary "stuff" of every day life. I'm an expert in furniture painting and refinishing. I love decorating redecorating with vintage, repurposed and found items. I'm a lifelong DIY'er who believes that you can have a gorgeous home on a budget! Sometimes, you'll find me painting furniture and sometimes, I'm baking or crafting or rehabbing our 1950's ranch. It's all here, and I'm sharing it! So join me, won't you? I promise that it won't be boring. 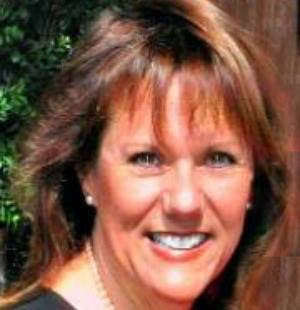 If you'd like to know more about me, please check out my About Me Page. Would you like SerendipityRefined delivered right to your inbox? Enter your Email Address below. I don't mind sharing content, ideas, and photos, so long as you ask me and link back to the Serendipity Refined site for credit. Unless otherwise indicated, all images and content contained in this blog are copyrighted property of Serendipity Refined. Unauthorized use and/or duplication of this material without express and written permission from this blog’s author and/or owner is strictly prohibited. One picture with a link back may be used provided that full and clear credit is given to Serendipity Refined with appropriate and specific direction to the original content.